I knocked this one out early since Ian was born in April. 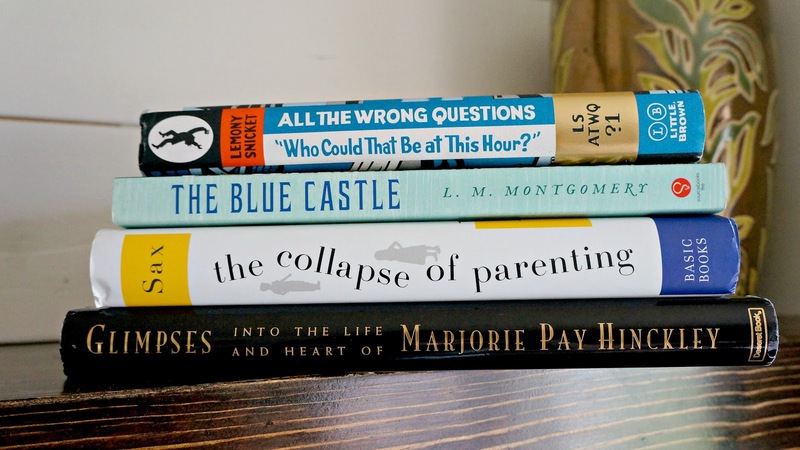 I chose two very different childbirth books, but I loved both of them immensely (and gave each a five-star rating). If expectant moms asked me for book recommendations, I'd recommend these two before any of the other ones I've read, especially if they're wanting a natural birth (but, as you know, this time I went with an epidural, and I still loved reading all the birth stories, but maybe that's because, at heart, I think I'm still a natural birth kind of gal). Anyway, the two books were: Baby Catcher by Peggy Vincent and The Gift of Giving Life by Felice Austin. In the preceding six months, this goal has been slightly modified to include Bradley. At first, Maxwell was not at all interested in reading some of the same books as me (he has since graciously changed his mind), but Bradley was. The whole point of the goal was to motivate myself to read some of the same books as my kids so I could be more involved with their reading, so I feel like my heart is in the right place even if it's not a strict three and three between Aaron and Maxwell. And just to clarify, these are not readalouds but rather books that we're reading separately but during the same span of time. So far I've read The Mysterious Benedict Society with Aaron, Who Could That Be at This Hour with Aaron, Cal and the Amazing Anti-Gravity Machine with Bradley, Muggie Maggie with Bradley, and Zita the Spacegirl with Aaron, Max, and Bradley. So as far as numbers go, I really only need to read one more book to complete this goal (and Max has agreed to have us both read Abel's Island by William Steig), but I'm pretty sure I'll read beyond the required number with this one. As I write this, I'm about halfway through the audio of Rose in Bloom. However, as I've mentioned before, I'm getting through far fewer audio books than I once did, so I've actually been listening to it for awhile, but I'm just making really slow progress. But we'll get there. I'm so excited to start The Blue Castle. I've been looking forward to this book for years but just haven't made the time for it. Until now. I've held off on this book on purpose because I think it will be most beneficial in November, just as we enter the cold, dark days of winter (shudder). Not that I don't think a simple lifestyle is appropriate in the summer. It is. But it just feels so much more necessary in the winter, like it might be the very key to my survival. I'm leaning strongly towards The Year of Living Danishly, but I would love any recommendations you think would fit the bill. I love reading mysteries in the fall, so I've been saving this goal as well. But I have no idea what I want to read! So start sending in those suggestions! The two Agatha Christies I've read so far are Murder on the Orient Express and And Then There Were None. I enjoyed both, so what would be a good one to read next? And as far as a series, I don't want anything too intense--think more along the lines of cozy mystery. This goal. Oh, this goal. It's going to be the death of me. I feel like I've read so much already, but my kindle says it's only 10% complete. I've been tempted to abandon it, but I feel like I haven't even come to the parts I was truly interested in, so I'm going to set some serious weekly goals to help myself knock out a big chunk of it. So far though, I think it's been rather disappointing. It seems rather ridiculous and unrelatable, so in the long run, it might not be worth investing fifty more hours of precious reading time. For now, I'll keep chipping away at it, and I hope I'll give myself permission to stop if it doesn't improve after another 20%. I just borrowed my mom's copy of The Collapse of Parenting by Leonard Sax, so I should be starting this goal anytime now. I've been meaning to read this book for over a year, so I'm excited to finally make some time for it. I've read two, and neither of them satisfied, so I'm still on the hunt. They were The Distance Between Us by Kasie West and Ten Miles Past Normal by Frances O'Roark Dowell. Honestly, they weren't bad (and they were clean, which was one of my major stipulations), but give me another three months and I know I'll have forgotten pretty much everything about them. You all have done a great job with the recommendations though, so I'm excited to check some of them out and continue my search. This was a fun goal to make because, at the time, I didn't know which book was going to win. It ended up being The Girl Who Drank the Moon by Kelly Barnhill, and it was fantastic. I've now discussed it with Suzanne in Episode 13 of The Book Blab, as well as my book club, and I'm convinced it was completely worthy of the Newbery. This book has been an absolute joy to read. I'm probably about three quarters of the way through and am already making plans to reread parts of it. I don't think my natural disposition is the same as Sister Hinckley's, which is terribly unfortunate and something I plan to write more about in the future, but I am incredibly inspired nonetheless. I'm glad the first half of 2017 has been filled with the wit and wisdom of this amazing lady. I'm planning to do two more progress reports soon (a look at my 2017 plan and a list of the books I've read so far) because if there's one thing about me, it's that when I make a goal, I hold myself accountable. How are your goals shaping up so far? I read The Year of Living Danishly, and I personally wouldn't recommend it for the purpose that you're looking for (a book on slow, conscientious living). For me, the book read much more like a travelogue, with the main plot being a foreigner taking on an unfamiliar culture and making commentary on it along the way. While the Danish culture did help her to slow down, it's not exactly the kind of book that would inspire you to do the same simply by reading it. However, I learned a ton more about Denmark and thought it was overall pretty interesting, so I'm not saying it's not worth your time at all...just maybe not for the purpose you had in mind. Some good simple living books I've enjoyed are 7 by Jen Hatmaker and Present Over Perfect by Shauna Niequist. I also just started New Slow City by William Powers, though I'm not far enough into it to make much of a judgment call either way. On another note, I love that your reading goals for the year are so specific! I've never thought about doing something like this; I usually set a general goal of how many books I want to read, and some years I've set goals to cross a certain number of books off of my recommended reading lists (and always failed miserably, it seems), but I really love how you've set this up. I might have to steal this idea for my resolutions next year! I'm so glad to get your thoughts on The Year of Living Danishly! I really would love to read a book about hygge, but I feel like that has become such a buzz word in the last year that now a lot of books have been written just to commercialize it. So I was hoping The Year of Living Danishly would talk about it without it being the main focus or seeming over the top. I've also looked into Present Over Perfect, but to be honest, I didn't love her book, Bread and Wine, so I've been hesitant to try that one. I'll look into your other suggestions though! Looks like you're going great! Have you considered "Present over Perfect" for your slow, conscientious living book goal? It wasn't perfect, but I actually enjoyed it more than some of her other books. I have thought about that one, but I didn't love Bread and Wine so I wasn't sure if I'd like that one any better. Good to hear that you thought it was better than some of her other books! This is perfect! Thanks for sharing it! I needed someone to compare the different hygge books for me and this post does just that! Goal 2: With my younger son, I often found it easier to see what he was reading and then read along, rather than plan in advance. He dislikes reading "what he has to" (school has not helped with this) so this made for a lighter touch. He didn't mind me reading his book, he just didn't want to be held down to a plan. For Family Book Club we sometimes would just ask him what he was reading and then his brother and I would pick that up. Goal 3: The Blue Castle is one of my comfort books, although I just realized I haven't reread it in a decade or so. Goes to show that my life hasn't been that bad, I guess. Maybe I'll reread it along with you. Goal 5: I love Miss Marple for Agatha Christie; Murder at the Vicarage is the first one although I no longer remember which story goes with which title. And I'm still recommending Carola Dunn's Daisy Dalrymple books for fun cosy mysteries. Goal 3: Just started The Blue Castle. I love it! Goal 5: Oh yes, the Daisy Dalrymple books! I'll definitely look into them. Do I need to start with the first one? Goal 6: Yes, I think I need to give myself permission to skim because honestly some of it is not at all relevant to me.